Security experts found a bug in computer chips made in the last decade that may leave a huge vulnerability in almost every computer in the world. Every manufacturer is affected, but Intel has the biggest problem. Their shares already dropped significantly, and the market may change greatly. End-users should pay extra attention to security now. At the beginning of the year, a serious security flaw was revealed in Intel, AMD and ARM chips. There are two vulnerabilities, Meltdown and Spectre. The more serious one only targets Intel CPUs, while the other affects virtually all modern chips in the world. In the last decade, all Intel CPUs started to use technique that leads to this problem. It’s called speculative execution and can be used by attackers to read out protected data, like passwords from computers. Since this is a hardware problem, it affects all brands using Intel CPUs: Windows PCs and Apple Macs alike. Another vulnerability affects AMD and even ARM chips, too, so smartphones aren’t safe either. Hardware and software manufacturers believe that the problem can be solved by software patches, but this has a price: performance will fall 5-30% due to the patch. This may be a problem for home users, but corporate users will have even more serious problems. According to Reuters, “some of Intel Corp’s (INTC.O) data center customers (…) are exploring using microchips from the market leader’s rivals to build new infrastructure after the discovery of security flaws affecting most chips”. The reason is simple: Intel’s chips suffer the most because of these vulnerabilities, and they may take the biggest performance hit, too. But they have the biggest market share, 98% in data centres, so this may be a huge change for the whole market. 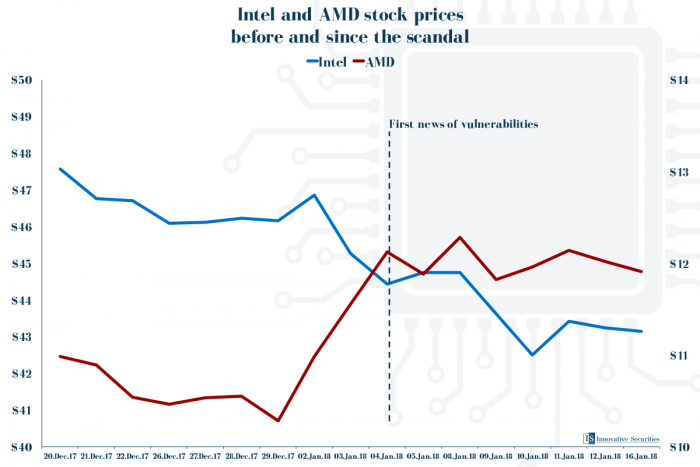 Ever since the first news of these vulnerabilities were published by The Register, Intel’s stocks are constantly falling while their biggest competitor’s, AMD’s are rising. It’s hard to know how the scandal will end, but there are some professionals who now recommend AMD over Intel and even the slightly weaker ARM chips may be in focus due to the mentioned performance fall. What an end-user can do? A home user has limited options to deal with this problem. At the moment, there are no new CPUs that are absolutely safe from the vulnerability, so buying a new computer is not an option. The only thing everyone can and should do is keeping their computers’ and smartphones’ software up-to-date all the time. Microsoft and Apple have already released updates to deal with these problems, and probably will make new, better patches in the future. This means that keeping our computers updated is not only important for new functions, but for safety as well, which should be a priority for everyone who has investments.